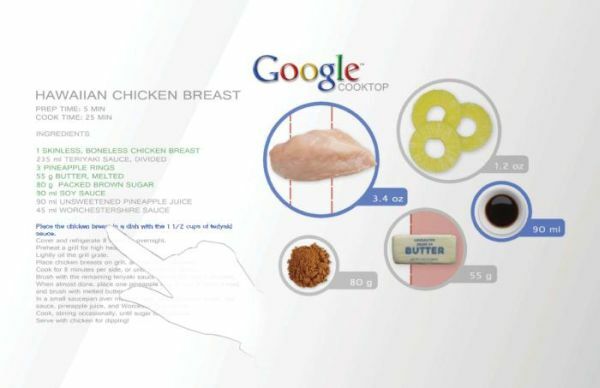 At first glance, I thought the Google Cooktop was an appliance. It’s not, it’s a smart countertop concept for the kitchen. 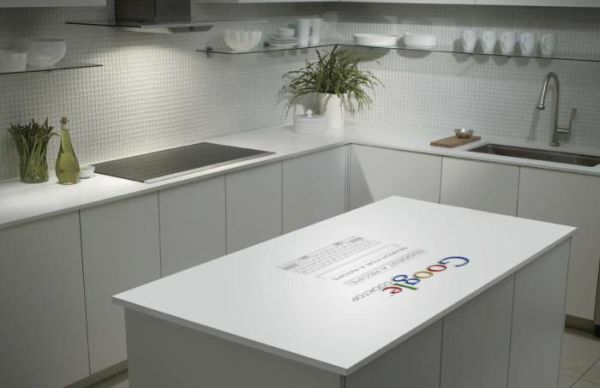 Created by designer Sarah R. L. Johnson, the Google Cooktop is an interactive screen embedded in your countertop. The Cooktop can either be connected wirelessly to the users’ computer or to the Google Cooking App on the users’ iPhone to access a catalog of the ingredients the user has in their home. The Cooktop can then suggest a recipe or the user can search the internet for a recipe of their choice. If you know your dinner guests really well (or they are willing to share very personal information with you), The user can then select the profiles of the people who will be attending dinner. These profiles are connected to an application called Google Cal Band which allows the Cooktop to these people’s access daily fitness routines and diet preferences and suggest meal type and appropriate portion size for each person thus reducing the chance for food waste. The selected recipe is displayed on the countertop surface. As the user compiles their ingredients and sets them on the surface of the Cooktop, the device measures the size of each ingredient as it is set down. Ingredients are then “weighed” by the Cooktop and visually cut down into suitable portions. When a particular item weighs too much, it is blocked out in red so the user can cut it down into a smaller piece. As the user begins to cook, they can check which step they are currently on and the Cooktop can then highlight which ingredient are needed for that step. The Cooktop also prompts the user by suggesting tips for the recipe and ensures that each meal is cooked to perfection. This could be a great solution if you tend to accidentally leave out ingredients. I am sure the Cooktop would not know what to do with too many substitutions of ingredients. It would probably react the way GPS units do and tell you to do a U-turn in your cooking steps.